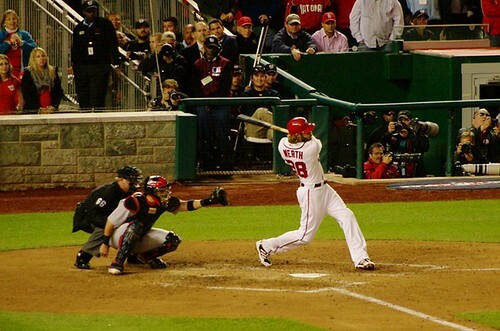 The Nats ended up with a total of twelve hits for night including three homeruns against Miami. For as inconsistent and lackluster as the Nats’ offense has been this year, Wednesday night was a treat. Outfielders Denard Span and Bryce Harper extended their hitting streaks, twelve and eleven games respectively, setting individual career highs for both of them. Shortstop Ian Desmond also hit his twentieth homerun of the year during the 9-0 shellacking. Washington scored their first pair of runs in the second inning when Harper launched a two-run homer that inched just over the flowers planted along the left field wall. Thanks to Gonzalez settling in and a struggling Marlins pitching staff, the Nats pounced on right-handed starter Tom Koehler, who only lasted five innings plus five batters, come the sixth when they tacked on four runs, including outfielder Jayson Werth’s twenty-first of the season. Washington’s sixth inning at-bats started with third baseman Ryan Zimmerman, 3-for-4 with a walk, hitting a single. The next three batters would reach: Harper walked, Werth crushed a behemoth three-run homer to left field, and Desmond singled while eventually scoring on a RBI-single hit by second baseman Anthony Rendon. The rally continued into the seventh inning with the 2-3-4-5 guys staying hot at the plate. Zimmerman, who ended up getting called out on a play at home, along with Harper, and Werth hit back-to-back-back singles before Desmond hit a two-out homerun to left field making it a 9-0 ballgame. Thanks to the Nats’ active bats and successful bats, Washington’s bullpen was able to get some much needed rest ahead of the Mets series in DC this weekend. Right-handed reliever Tanner Roark was the only bullpen guy to enter Wednesday’s game and pitched a spotless eighth inning on five pitches before retiring the side in the ninth. Roark gave up one hit in his appearance. The Nats have now won eight of their last nine games and fourteen of the last nineteen. They are six and a half games back in the National Lead Wild Card race.